In his 1906 book, The Future in America: A Search after Realities, H. G. Wells talked of his experiences in a rapidly changing New York City. At one point he talks about walking down Fifth Avenue as evening began to fall . . . 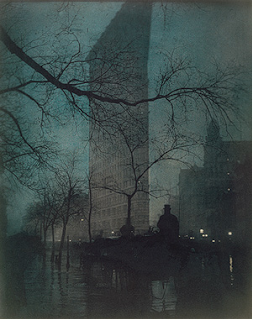 The Flatiron Building, located just off Madison Square Park on a 9,000 square foot triangular lot formed by Fifth Avenue and Broadway, was originally built for the George Fuller Company, a construction company that George Allon Fuller established in 1882, two years after he had moved from New York to the fast growing city of Chicago. By the time of the 1893 Columbian Exposition in that city, Fuller was rich beyond measure. Also by that time Fuller, based on his experiences in Chicago, had concluded that steel was both more flexible and stronger than the conventional cast iron and therefore more suitable to the construction of tall buildings. The year after Chicago's great fair ended, Fuller met a man named Harry St. Francis Black, who married Fuller's daughter, Allon, that same year. Black apparently was one of those young guns in Chicago who would go to any lengths to advance the cause of capitalism -- as long as the capitalism benefitted them personally. Fuller made his new son-in-law the vice-president of his construction company and upon Fuller's death in 1900, Black took over the company, merged it with another and, with 20 million dollars of walking around money, the George Fuller Construction Company became the largest firm of its kind in the world. Black, as CEO of the Fuller Company and as the chief investor in a real estate syndicate, the Cumberland Realty Company, bought the triangular plot of land just off Madison Square Park in 1901 for two million dollars. This is where the Fuller Construction Company was located until 1929 when the company moved into its new art deco skyscraper at 57th Street and Madison Avenue. The Fuller Company, by the way remained, a viable entity until the 1970's, and it has a particular importance to those of us who love Chicago beyond the fact that the company began in the Windy City. 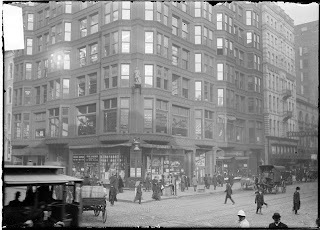 Fuller Construction erected Holabird & Roche's Tacoma Building of 1889 at the corner of LaSalle and Madison Streets, arguably the first skyscraper in which the outside walls did not carry the load of the building. According to the Encyclopedia of Chicago, Fuller's firm "was one of the first true general contractors: it completed large structures by coordinating the work of hundreds of men working under several subcontractors." To say the system worked would be an understatement. Between 1900 and 1914 the company built over 600 buildings, including the Marquette, Pontiac and Rand McNally Buildings, and department stores for the Fair, Marshall Fields, Carson, Pirie, Scott and Montgomery Ward. Fuller had its hand in the construction of Tribune Tower, 135 South LaSalle, what is now the Chicago Hilton on Michigan Avenue, Naess and Murphy's Prudential Building of 1955 and as one of its last projects, Joel Hillman's 150 North Wacker Drive, the "swinging building." You couldn't walk more than a block or two through Chicago's Loop without finding a Fuller-constructed building. The next installment of the Flatiron blog will return to Madison Square Park and examine the building itself in more detail. I like the Flatiron building. There are several Flarirons modeled after the one in NY, There is one in Atlanta and another one in Vancouver BC.